As termites become active this spring, make sure that you learn about termite treatments in New England. Well, it is that time again when homeowners in New England have to start looking out for termite infestations. Termites in New England often live in the ground and not only are they hard to locate, but they are hard to get rid of as well. That is why Modern’s termite control program is an important component to your protecting you home. Considering that these wood destroying pests are responsible for over $5 billion in property damages each year, they are not a pest to overlook. Discarded wings from swarmers (the reproductive termites). Mud tubes in the ground from termites moving to and from wood sources. Accumulations of dirt near the foundation or on the property. Damage to wood that may appear warped or sagging. Keep in mind that since termites live underground, it is not likely that you will spot them the same way as you do ants in the kitchen. Termites do their work from the inside out, silently hollowing out wood structures and homeowners don’t usually notice a termite infestation until the damage has been done. What is a worried homeowner to do? 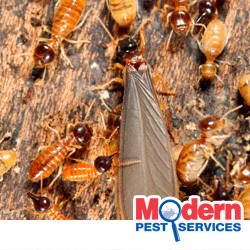 Call Modern for a FREE inspection to see if our pest professionals find any evidence of a termite infestation. Our termite control program includes a thorough inspection of the home and property for signs of termites. Then, if there are termites present or if you simply want peace of mind that you are protected from termites, we will install the Sentricon® Colony Elimination System which will kill existing termites and prohibit new colonies from forming. This is what national monuments like the Statue of Liberty are protected with! After we install the termite baiting system, we will continuously monitor for termite activity and perform regular maintenance of the Sentricon system. To learn more and to get started with your own termite control program, please contact us today! We also provide general pest control solutions throughout Maine, Hampshire and Massachusetts. Modern Pest Services is a 2012 Angie’s List Super Service Award winner!